When he started a master school program in 2012 in the Alps, found out that his live is in danger. There was no possibility to buy a sandwich, less to go with a taxi somewhere. He barely could climb a dozen of stairs. However, he had no other choice. He had to study, and the place is such where the stairs and weight loss can’t be passed around. 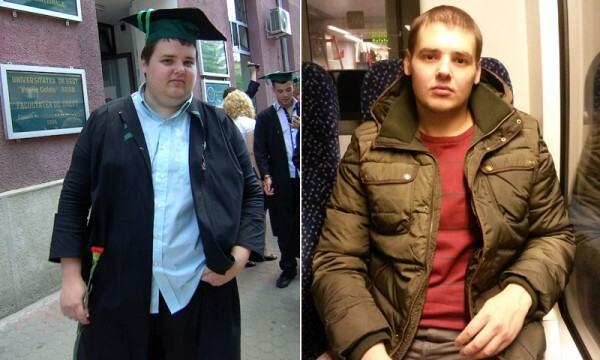 Walking every day he succeeded in losing 125 pounds. However the key to success wasn’t only in walking. He completely changed his lifestyle. Consuming of healthy food became his basic priority. The rocketed weight loss was caused by removing of chips and junk food from the menu replacing them with vegetable, meat, mushrooms, legume, sugar pea, beans etc. Of course he had to quit drinking sparkling beverages replacing them with drinking water. After replacing these bad habits, only thing remaining was to quit smoking. But, it was amazingly easy to do this after all the changes. It was quite harder to leave the chips than the cigarettes. After all of this, his conclusion was that he had only one obstacle for weight loss – the MENTAL. Everyone can accomplish this. Only things necessary are healthy reason and desire. There is a solution for everything else. In this manner he succeeded to lost incredible 205 pounds. The goal set was 185 pounds. Let’s jump to his blog “Hiking to Fit”, where he describes weight loss more detailed. Look around the other articles too. There you can find some useful advices such as: Which one burns more fat? Running or hiking?